PNB's Noelani Pantastic and James Moore in Jean Christophe Maillot's "Romeo et Juliette"
Ballet is built on a foundation of romantic stories; the art form is a natural conduit for tales of love and loss. You know Shakespeare’s story: Romeo and Juliette are from two rival families; they meet at a dance; sparks fly. Romeo tracks his paramour to her house, where they swear their love to one another. Maillot’s version of this classic tale, onstage now at Pacific Northwest Ballet, re-creates this scene as a dizzying, joyful and very steamy encounter. Romeo (PNB principal James Moore on opening night) spies Juliette (principal Noelani Pantastico) atop her balcony—a long, white ramp in this production. He is oblivious as his white jacket drops from his hands to the ground. Leaping across the stage as if he can’t contain himself, he spins on one foot, arms extended loosely over his head, a dreamy smile on his face. PNB's James Moore and Noelani Pantastico in "Romeo et Juliette"
When Juliette descends to meet him, we can see that her desire matches his. Her right hand flutters toward Romeo of its own accord, the physical manifestation of an attraction she can’t subdue. The hand pulls her to Romeo, like the proverbial moth to a flame. Their palms meet, and trace together a waving path, up into the air, like wisps of smoke from the flame itself. The young lovers tease out their courtship dance. Romeo grabs for Juliette; she neatly evades his hands, and skitters away, only to sidle back to see why he hasn’t chased after her. PNB premiered Maillot’s ballet in 2008, and Noelani Pantastico danced the role of Juliette in every performance in that production. It must have enchanted her, because she followed Maillot to dance with his company, Les Ballets de Monte Carlo. She danced Juliette many times over her seven years there. Now that she has returned to Seattle to finish her career with PNB, Pantastico brings her experience and her insight to the role. She embodies it. Pantastico and her Romeo, Moore, are all strength and passion, fully committed both to their characters and to the choreography. That commitment shows in everything from the extension of their fingers and toes, to the frankly steamy kisses they exchange. PNB's Lesley Rausch and Jerome Tisserand in "Romeo et Juliette"
They alternate in the title roles with fellow PNB principal dancers Jerome Tisserand and Lesley Rausch. These two bring equal commitment to their performances, but a very different quality to Maillot’s choreography. Where Moore is earthy and muscular, Tisserand is slim and elegant. His Romeo is almost other-worldly in his devotion to Rausch’s Juliette. And where Pantastico’s movements are defined, sometimes almost angular,Rausch’s long arms and legs seem to curve around the choreography. If Moore and Pantastico steam up McCaw Hall, Tisserand and Rausch’s love shimmers and floats like a rainbow-tinted soap bubble. “Romeo et Juliette” is much more than this one pas de deux, of course. And the PNB dancers were uniformly strong opening weekend. PNB's Seth Orza, l, as Tybalt and Jonathan Porretta as Mercutio in "Romeo et Juliette"
Three stand out: Principal Seth Orza looked sleek and menacing as Tybalt. He oozed seduction with Lady Capulet, venom with Mercutio (welcome back Jonathan Porretta!!! ), and macho aggression around his minions. Soloist Margaret Mullin excelled as Juliette’s Nurse. When she twitches her finger to summon her young charge, we’re amused by her spiky portrayal of the character, and somewhat awed by the fine control she exhibits over this single digit. And last, but not least, there’s corps de ballet member Miles Pertl, dancing the pivotal role of Friar Laurence. The Friar’s job is to set the story in motion, and to foreshadow its tragic ending. Pertl threw himself into this task both physically and emotionally. 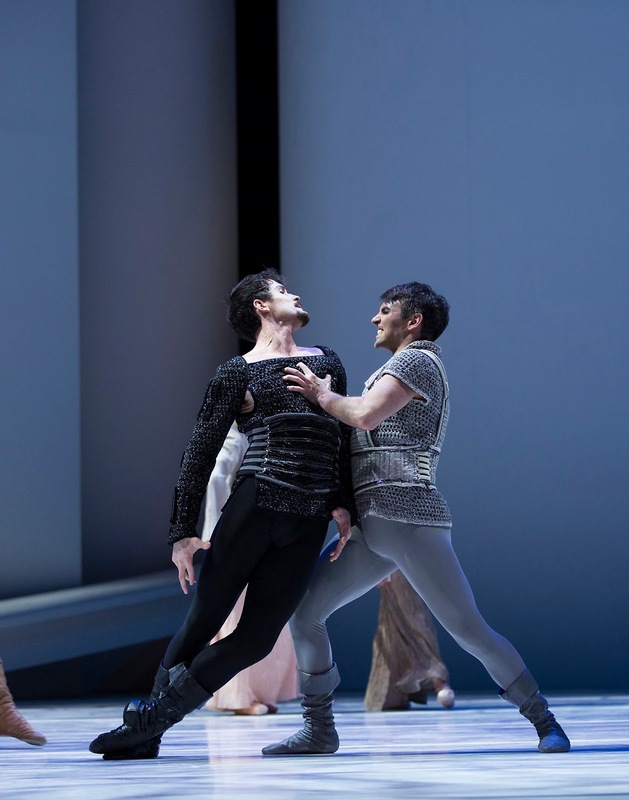 PNB corps de ballet member Miles Pertl as Friar Laurence, with Noelani Pantastico in "Romeo et Juliette"
These three dancers will appear in every performance of the current production. Lucky audiences. I must also mention the beauty of Prokofiev’s score, ably performed by the PNB orchestra. And costumes by Jerome Kaplan, sets by Ernest Pignon-Ernest and lighting design by Dominique Drillot, all enhance our experience in the theater. Ultimately, though, “Romeo et Juliette” is about the exultation of first love. Through Maillot’s choreography and the skill of the PNB dancers, we get to remember the heady, giddy joy of our own experiences. It’s simultaneously hauntingly beautiful, and achingly sad. Indeed, words can't express what happens onstage in "Romeo et Juliette."